MELBOURNE, Florida -- The 2012 Honor America Independence Day Parade in Historic Downtown Melbourne took place on a very hot Fourth of July today at 10:00 a.m. The parade began near the railroad tracks and traveled westward towards New Haven Avenue to Oak Street, and ultimately ending at the Honor America's Liberty Bell Museum. This year is an election year. 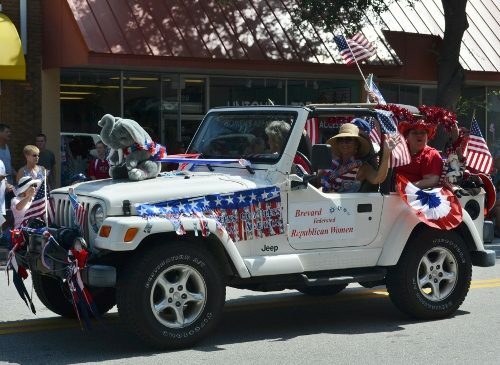 So the bulk of the parade participants were local Brevard County political candidates running for office with civic groups like the Sons of the American Revolution, veteran's organizations, Boy Scouts, and clubs such as the Corvette Club of Melbourne sandwiched in between the campaign floats. Countywide, Republican candidates for Brevard County Property Appraiser Jason Steele and Dana Blickley, Brevard Sheriff candidates Wayne Ivey and Todd Maddox, Clerk of Court candidate Mitch Needelman, Brevard County Commission candidates Helen Voltz and Jason Mahaney, School Board candidate Dean Paterakis, and judicial candidates Sean Cutshall and Morris Richardson took part in the parade. Meanwhile, Judge Judy Atkin, walked up and down the parade route handing out campaign literature to the parade spectators.